It was slim pickings this week. Second favorite would be Kaycee drinking from the bottle..
With the Battle back I am expecting for a more exciting coming up. Another day another Hive member hits the door. Yes Brett’s game has gotten a lot better with Winston gone. I’d vote for him to win. I’m still loving that Kaycee beat Faysal in the veto competition. Sorry Simon but my vote goes to Angela above. Last but not least. 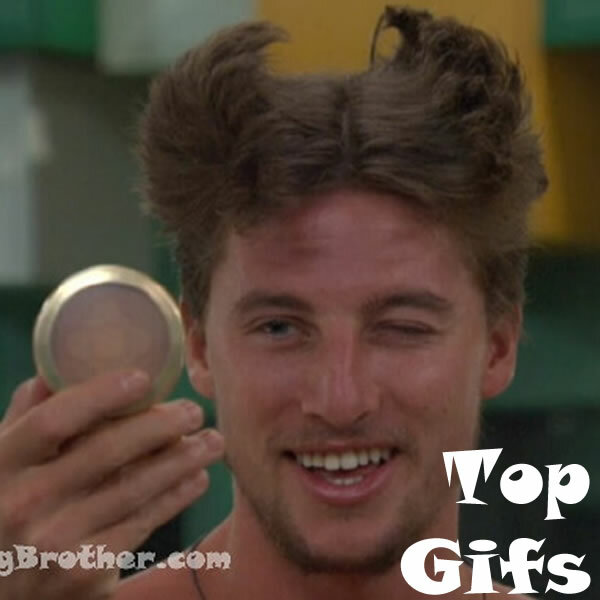 My favorite is Brett’s “Ace Ventura” look :) Fez, as usual, being a doush in his eviction speech. Yeah, you set your girl up REAL good, you moron. Noticed when Haleigh sat back down after her gracious speech that she sort of physically distanced herself from him. Just for the record she wasn’t performing the Nutcracker nor any other ballet, she was doing the bar warm up exercises (I saw her doing positions one and two while the camera was on her). my bad I thought she was performing the nutcracker like she did for gorbie in the Bolshoi Theatre. Brett is featuring a most popular hairstyle from the good folks of Whoville. The wondrous Mayor of Whoville began the fad when the Grinch came for Christmas one year. Many of the great townspeople liked the style so much, they copied it. Doesn’t Brett look smashing good?